Training retail employee engagement with POS software training | A blog about smart POS software for independent small businesses. 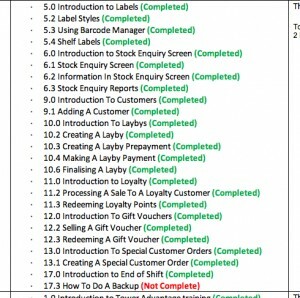 Managing access to our new comprehensive online video based POS software training is a sophisticated website with which retailers and retail employees can track the training undertaken, the progress through the various curriculums available in the training library. This back-end management is vital for all participants. Retail employees doing the training can easily keep track. Their employers can track too and be ready with kudos at key milestones. 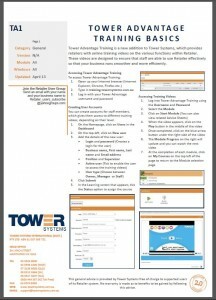 The website and the structure it provides shows off the professional approach Tower Systems has taken to delivering access to this tremendously valuable training resource. The end game goal is to help everyone using our Point of Sale software be more proficient and certain in their use and thereby more valuable to the business. 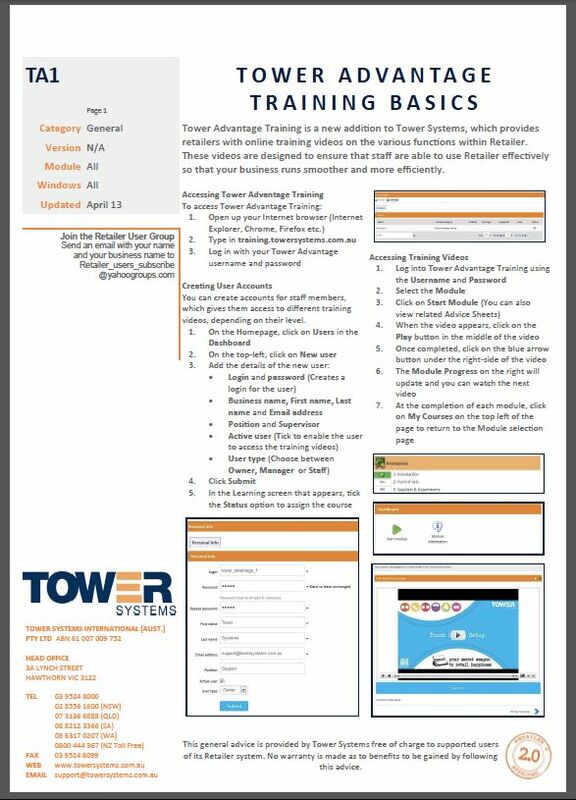 Six weeks ago, Tower Systems has released the most comprehensive and most accessible POS software training ever produced for small business retailers and their employees. Separate curriculums cover each retail channel, delivering retail channel specific specialist education. The total training content available per retail channel is between seven and ten hours. The image shops an advice sheet created to help retailers and retail employees make the most of the training resource. 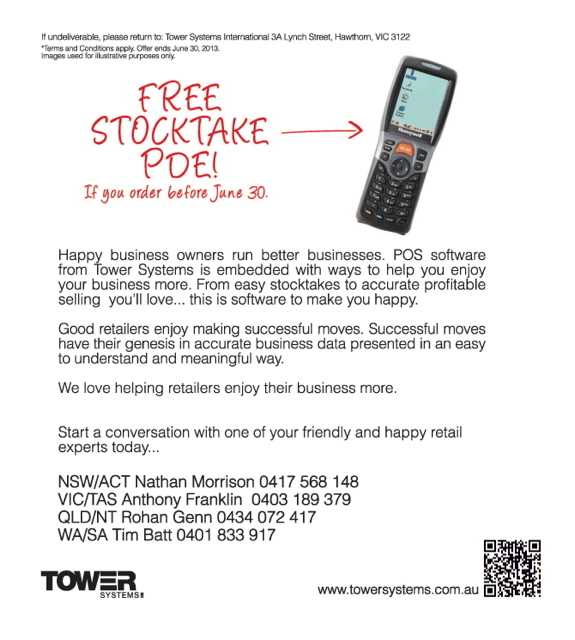 Point of Sale software company Tower Systems is offering a free PDA to retailers purchasing its POS software between now and June 30, 2013. This is an excellent value-add gift as it gives retailers a tool for more efficient stock takes and a tool with other uses in any retail business. The productivity gains are valuable to any retailer! This brand-name high-quality PDA adds value to the Tower POS software package and makes for a very special end of financial year bonus for retailers looking to invest in infrastructure that delivers genuinely more value to their business in the next financial year. This offer is exclusive to Tower Systems. o Product Removal: Crazy Johns Recharge $55, Crazy Johns Recharge $95, Crazy Johns Prepaid $129, Crazy Johns Prepaid $149, Crazy Johns Cap $79. o Voucher Update: Voucher text update for all denominations. o Product Removal: Lebara Mobile Mega Plan $49.90 and $59.90. o Product Removal: All denominations. o Voucher Update: Voucher text update for 3 PrePaid $30, $50, and $100. o Product Removal: Xbox360 Live Gold 12+1M COD BlackOps 2 AUS, Xbox 360 Live Gold 12+1M HALO 4 AUS..
o New Products: Xbox360 Live 1000 Points ESD AUS. 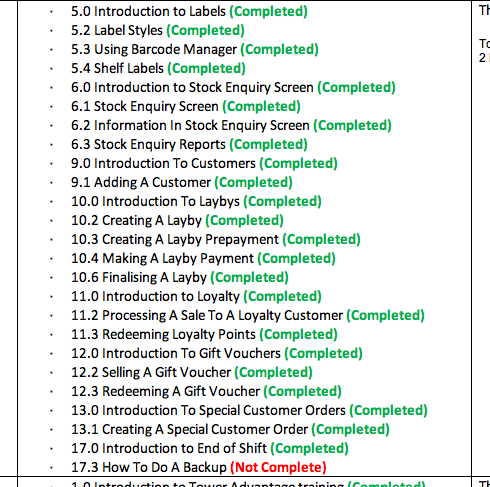 The Doing a Stocktake live free online training workshop Tower Systems has been running this year for retailers using our Point of Sale software continues to attract excellent numbers of attendees. Indeed, bookings are so strong that even additional sessions scheduled fill up – leading more to be added. Our 2,000+ retailer community has embraced the live online workshops as an ideal means for delivering access to training and we are happy to oblige with more and more training opportunities. As the leader in delivering access to online training in our respective marketplaces, we have established a benchmark not only in terms of numbers of sessions but also in topic diversity. Plus we show customer care by adding repeat sessions for the most popular topics. To see the free online training immediately available for booking please click here. The most consistent experience from retailers engaging in the new Discount Vouchers facility released now in the latest Point of sale software from Tower Systems is the wow factor, the pleasure and excitement from shoppers happy with a fresh approach to rewards for loyalty. Embedded in the wow response is a boredom with points based loyalty programs. Retail shoppers are tired of accuring points of different value and having, too often, to jump through hoops to access the points. The time was ripe for change and Tower Systems has delivered change with its new Discount Vouchers approach. While still supporting the decades-old approach to points based loyalty / VIP cards, the new Discount Vouchers facility delivers a genuinely fresh approach that is getting shoppers engaged beyond what is traditional – spending more and sooner and this is vitally important in retail today. Tower Systems has delivered access to the Discount Vouchers facility to all Tower AdvantageTM customers without additional cost. We have been helping a couple of small business retailer5s recently to switch from our software following frustratying experiences they had with their other software that updated without their control. Our advice to retailers on software updates is to update when they are ready, knowing what you will be getting in the software update and how you cann use this in your business. Be conscious about updating your business software – it’s mission critical and you needs to be in control to serve your needs. Letting your software be updated without your knowledge or control could result in operational problems – as these retailers found. It could result in operational changes you and your team are not across. So, take care, update your retail business software when you’re ready. be in control. This is retail best practice. To make it easy for local technicians to properly configure computers and other hardware to run our Point of Sale software, many years ago Tower Systems published setup and standards advice. The POS hardware setup advice is published publicly so that anyone can access it. The advice has been regularly updated – to ensure that everyone has access to the same set of standards. We get frustrated when we are asked to help resolve problems with systems that have not been setup according to our standards. This can waste time while we work out what has been done in a non-standard way and whether this has been done for a value reason. Recently we lost a day of time working through this – all because a local technician who had fled the seven and was uncontactable had not followed the advice we had provided. Another way we have been helping some retailers using our POS software today is through our free business health check service. Today, Saturday, we have provided thoughtful and insightful analysis into the data cultivated by our POS software as used in several retail businesses. We dig into the data, look at benchmarks and provide our thoughts on the performance of the business. All free … adding value to the relationship we have with our customers. The business check service is another free Tower AdvantageTM service we offer our retail partners. 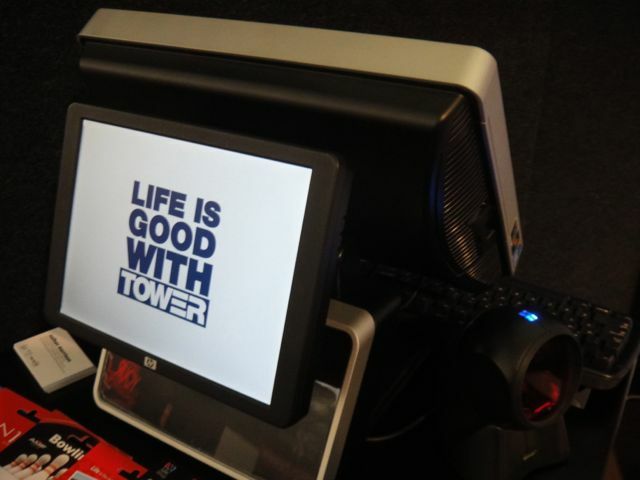 Today, Saturday, the Tower Systems Point of Sale software Help desk is open for business. This live office-based help desk is in addition to our usual after hours support coverage. Having an office-based help desk is a valuable point of difference for our customers – as they tell us. It means we can handle the tytpes of calls that require access to more tools and facilities than someone can have access to when only providing support on the end of a mobile phone. Sydney: 02 9525 6444 Mon-Fri.
Brisbane: 07 3136 6888 Mon-Fri.
Perth: 08 6317 0207 Mon-Fri.
Adelaide: 08 8121 3366 Mon-Fri. In addition to this office based service is our multi-phone mobile based after hours numbers. We’re here for our customers when they need us. A new breed of gift shop owner is using shopper basket data to make savvy business decisions. These business operators are running growth businesses – focused on business outcome success. Typically, they are retail professionals running their businesses based n a well-considered business plan. Whereas in the past many gift shop owners ran their businesses on a whim, today’s real success stories are businesses operating on principles of professional retailing. Tower Systems is privileged to be working with several groups of such gift shop and homewares retailers, providing input on business plans, showing how our gift shop POS software can shine a light on business activity and unlocking other ideas for business improvement. Working with such proactive retailers helps the Tower business and its software as much as it helps our customers. We are grateful for the openness at the core of these opportunities. Thanks to a broad range of gift shops using the Tower software we are gaining experience from small, medium and large professional gift and homewares shop operations through this business development work. While many Point of Sale software companies place more barriers between themselves and their customers, Tower Systems actively encourages direct customer contact through its live help desk. Whether it’s a software support question, business advice, additional training or some other matter, we are here for our customers. We engage beyond the help desk too. Through our management team including our in-house CPA we have access to a range of knowledge, experience and resources on which we are happy to draw to better serve our customers. So, while other software companies appear to not like or retreat from human interaction we encourage it. Retail is primarily a face-to-face business after all. POS software company Tower Systems is enjoying excellent hardware sales thanks in part to the three-year on-site warranty provided by hardware partner HP with its POS gear. The three on-site hardware warranty coverage is a point of difference over generic hardware. It’s a point of difference Tower systems promotes and benefits from. All it takes is one hardware malfunction in the three years for a retailer to reflect positively on the value of the peace of mind coverage. The most popular POS hardware from HP covered by the on-site warranty service is the all-in-one register. This slick and sleek unit is loved by retailers who line a clean and organized counter. The Discount Vouchers facility released in the Tower Systems Point of Sale software two weeks ago is an excellent example of the value of retailers being covered by a software support agreement. Tower Systems included the completely new facility in the software for no extra charge – even though it could have charged since this was a completely new facility- separate to existing VIP and loyalty facilities in the software. Adding value like this, delivering completely new functionality, is not what software companies usually do. It reflects on the tower commitment to genuinely add value without costing its user community anything extra. Tower AdvantageTM customers have access to the Discount Vouchers facility and other enhancements in the software for not additional charge. 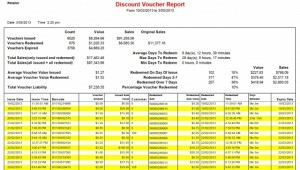 In addition to the Discount Vouchers facility itself there is documentation on how the use the facility, personal setup support and other facilities for making the best use of the new tools in your own retail business. Tower is taking a whole of business approach to introducing Discount Vouchers. This is an excellent and appreciated point of difference for Tower Systems customers. It provides retailers using other software another reason to make the switch. Two weeks ago Tower Systems released an update to the MrNews newspaper distribution software to meet the latest standards from West Australian Newspapers. Developed overs several months in consultation with WAN and active distribution newsagents, this latest update is available to all MrNews newsagents. Tower Systems acquitted the MrNews software business late last year, bringing another 100 newsagent customers to the tower Systems newsagent community. The Tower Systems garden centre software is on show this week at the Green Expo Sydney, an event of the Nursery & Garden Industry Association of NSWACT. We are honored to be a silver sponsor of the association and this important event. 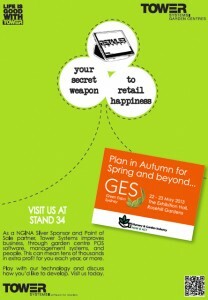 On show will be our new software for garden centres and nurseries. Trade show attendees will get to see fresh software designed for their particular business niche, software developed in close consultation with their colleagues. We are looking forward to feedback that will help up enhance our garden centre software event further – trade shows are an excellent opportunity for this type of networking and learning for our sales and software development teams. 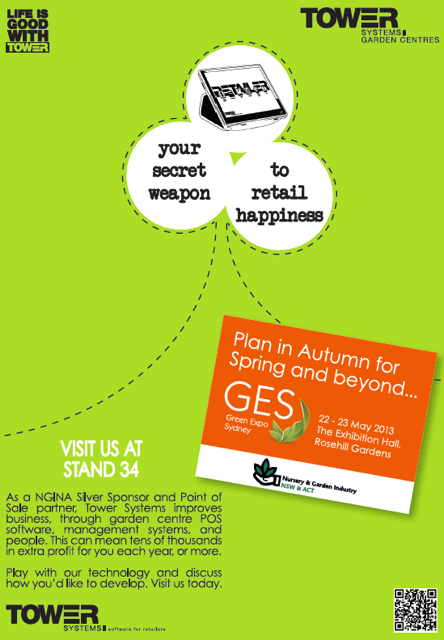 The image shows a flyer we have produced to promote our participation in and location at the trade show. It’s been sent to all garden centres and nurseries in NSW and ACT over the last week. We’re excited for what is expected to be a terrific event. Small independent retail businesses have one major benefit over their big business competitors – their size. Being small makes it easier to implement change and change is where innovation can be tested, refined and leverage. Big retail businesses, by their very size, take time to develop new initiatives and roll them out through their network. Small business retailers can move fast and they can change from a plan fast. This is an opportunity. Tower Systems will happily work with any of its small business retailer customers on assessing plans and opportunities to make changes in the business. We can look at your data and talk with you about opportunities. We will happily do this with any of our customers as often as they like – because change is important in retail. The days of set-and-forget retail are over. So, small business retailers can embrace the opportunity of their size and change regularly. We’ll help in any way we can. Tower Systems is proud to be exhibiting its newsagency POS software at the Lottery Agents Association of Victoria conference tomorrow. we are grateful of the opportunity to mix with lottery agents and share our latest tools that could help them build more efficient and successful businesses. Thanks to the secret trial release of the EXCLUSIVE Discount Voucher facilities in the Tower Systems Point of Sale software in February this year, the company has access to insights into how shoppers are interacting and changing behaviour as a result of the new tools. From anecdotal evidence of behavioural change at the sales counter to shopper returns a week or more out from receiving a voucher, the Discount Vouchers are changing shopper behaviour. We see this across various businesses. 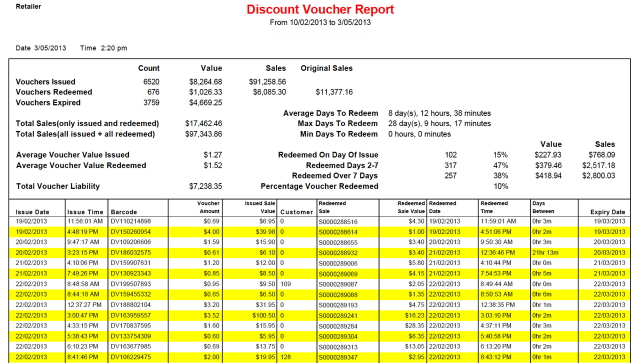 Thanks to smart tracking and reporting, we see how every voucher is treated. If someone comes back in 20 days after receiving a voucher, the software knows what was in the original purchase and what is in the purchase in which the voucher is redeemed. This data provides retailers with evidence backing up anecdotal data – it can feed fact-based decisions on adjusting the levers of the Discount Vouchers tools. We had one customer shopping with us for the first time buying ink for work. The voucher he received was enough for him to buy a magazine he’d only occasionally treat himself with. He said for sure he will be back within the month for more ink and another free magazine. We expect this customer to be worth $1,500 a year. A mum bought some birthday cards and gave the voucher to her daughter who used this and her pocket money to buy a Beanie Kid. She’s a Beanie Kid collector and said she will be back for more. A young Beanie Kid collector can be worth hundreds of dollars a year. Every day in the secret trial stores since February there have been stories like these playing out, stories of customers deepening their engagement with retail businesses because of the Discount Vouchers. 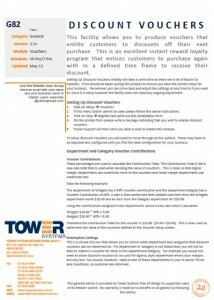 Tower Systems published comprehensive written advice when releasing the Discount Vouchers facility with its Point of Sale software earlier this month. This peer-reviewed advice has been instrumental in helping many retailers embrace the new facility. 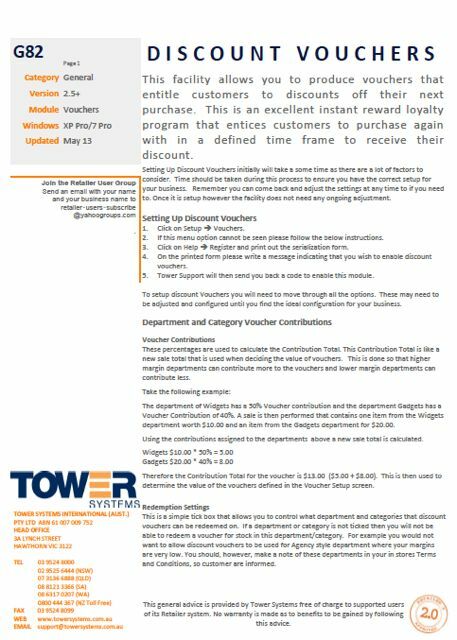 By providing written documentation as well as over the phone advice and other support access points, Tower Systems is ensuring that retailers are able to access everything they need to use the new Discount Vouchers. Indeed, the level of care taken in providing advice and help speaks to the extent Tower Systems goes to ensure its customers have a good experience with new facilities. Provided with the software update, the advice sheet is comprehensive and offers excellent guidance to retailers in the setting up of Discount Vouchers for the first time. The latest release of Point of Sale software from Tower Systems, released today, delivers support for the recently announced changes to the Tourist Refund Scheme announced by the government. Duty Free purchases can be made up to 60 days; previously 30 days. Travellers Statement is updated with new rules. The TRS website has details on the latest changes. In developing these enhancements, Tower Systems reinforces its commitment to maintaining the currency of its software. Jewellers, bike retailers, gift shops, homewares stores and garden centres will all benefit from these latest changes to the Tower software. Tower AdvantageTM customers will receive access to the update for no additional cost. Retailers using the Tower Systems Point of Sale software have rushed to take up the opportunity of the ground-breaking Discount Voucher facilities released for commercial use in Retailer 2.5. Seen as a game-changer in shopper loyalty stakes, the Discount Vouchers facilities are being discussed by Tower users when talking about the update. the company is tracking uptake and it’s considerable. While the Tower software continues to support VIP / loyalty cards (as it has done for many years) if’s this new and innovative approach to shopper loyalty that has captured the imagination of the Tower retailer community. 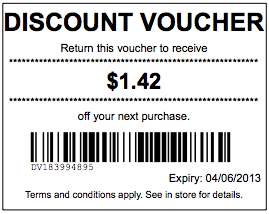 By front-ending the loyalty reward, the Discount Vouchers engage shoppers earlier. They also enable the capture of shopper details for marketing and promotions – offering the best of the old and the innovation of the new. While they have been in live use since February this year, Discount Vouchers were only commercially released to the wider Tower user community earlier this month. 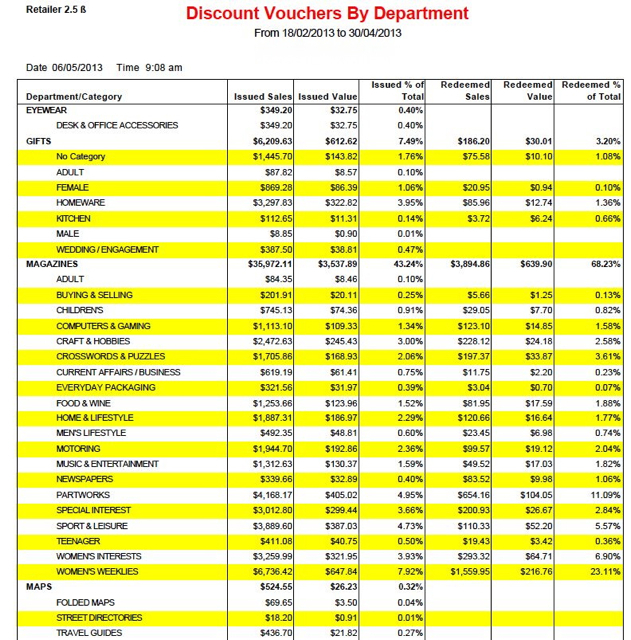 In addition to tracking vouchers issued, redeemed and expired using the Discount Vouchers facilities released by Tower Systems in its Point of Sale software, there is a report that shows the products benefiting from redemption of the vouchers. This report helps retailers make more money. 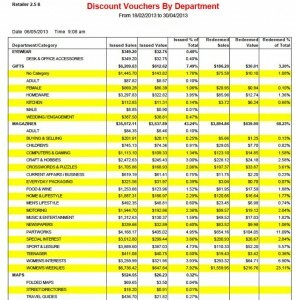 Retailers secretly testing Discount Vouchers since February this year have been excited to see the categories of products shoppers use the vouchers to purchase as they have often been products they did not expect. This information is an eye opener, providing a fresh view of the business. This delivers even more value from the Discount Vouchers than the facilities themselves. In providing retailers with these Discount Vouchers reporting tools, Tower Systems is empowering retailers with information to drive business decisions and an delivering insights into how the facilities are being used by shoppers – this is gold for retailers. The Discount Vouchers facilities come with excellent business levers that can be adjusted to change shoopper behaviour. This is where the reporting tools shine – in guiding retailer engagement and through this driving business performance. The new Discount Vouchers facility released by Tower Systems after months of secret in field testing has been packaged with a suite of business performance reports that help retailers drive maximum value from the power new shopper loyalty facilities. These reports document shopper engagement and the value to the business of this. They are key to retailers extracting value from the new facilities. Packaged with three valuable management reports, the Discount Vouchers facilities enable retailers to track shopper engagement from the initial purchase through to the redemption. The report shown here is the first of three reports, it provides a snapshot view of what is happening in the business – vouchers issued, redeemed and expired and the speed within which shoppers engage. The experience over the almost four months secret trial of these exclusive facilities is that retailers use this reported performance data to tweak the levers within the Discount Vouchers to deliver even better outcomes from the shopper loyalty program. Delivering a powerful facility and backing this with professional and well considered management reports gives to shoppers a more valuable solution. This is the feedback from the retailers who have been testing and using the Discount Vouchers in their businesses through the secret trial period. In delivering Discount Vouchers in its Point of Sale software, Tower Systems is delivering leading-edge loyalty facilities that enable retailers to break free from the me-too approach of points based programs that shoppers have become bored with and untrustworthy of.